There is SO much sickness going around here - it's just crazy! Last week I subbed at Kalia's school several times, and this week, Kalia has been home with a fever since Sunday. Now Randy seems to have caught the bug. Are you all staying well? I know people are getting sick everywhere, and schools are even shutting down because it's just ridiculous how many kids have been calling in sick! Although it seems to be cold and flu season, I could never, EVER bring myself to use such beautiful hankies as kleenex. I have a small collection of vintage hankies passed down from my Grandma, but unfortunately, they are just sitting in a little box in the closet. After we move, I have decided to use them in Kalia's future playroom. I informed my mom that 'we' have a sewing project, and she agreed to help me create a window treatment. 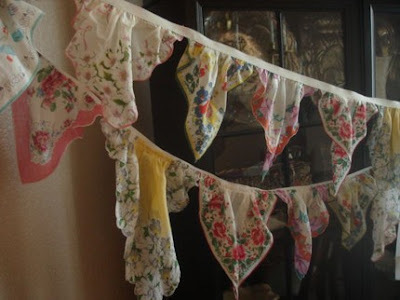 I also wanted to share the first photo, because I love bunting oh-so-much, and love the idea of creating bunting out of old hankies. Isn't that great?! If you aren't feeling ambitious enough to tackle the project on your own, you can purchase the bunting in the photo at the etsy shop 'Poppylarity'. Oh! The second photo is just for inspiration - I haven't actually made mine yet. Y'all stay well now! UGH! I have a question for you other blogger users...do you ever have issues with spacing or separating paragraphs on here?! SO obnoxious. I'll try to fix it later. Those hankies are so pretty! 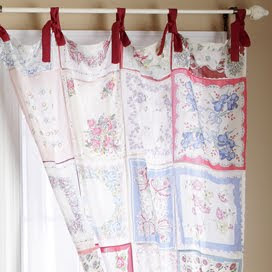 I just love vintage textiles. I love those pictures. One of my favorite magazine cutouts I have is of a bedroom where they made a dust ruffle using handkerchiefs. That's a great idea! I'm not a fan of the red ties in the second photo, but it's good for inspiration, anyway.